Anderson Contemporary was founded by Ronni Anderson in 2015. Outside traditional art districts, Anderson is carving a niche in the trending FiDi-Seaport neighborhood with its fine art gallery located in the expansive lobby space of 180 Maiden Lane, a commercial building on the corner of South street. 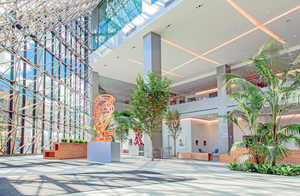 The unique idea of housing a curated art gallery in the public plaza was the brainchild of Anderson and David Sturner, President and CEO of MHP Real Estate Services, one of the owners of 180 Maiden Lane. This innovative approach to the space has produced a quality arts program accessible to the public while generating exposure and art sales for many well established and emerging artists. The gallery is proud to represent a diverse group of visionary artists working across media, including painting, photography, mixed media and sculpture. The exhibition program includes solo and group shows as well as select collaborative exhibitions. Anderson is dedicated to providing expert guidance and personal attention to private and corporate collectors in acquisitions of works of art. After backpacking through Europe in 1989, Ms. Anderson landed in NYC with a degree in French Language and Art History and began working for Sotheby’s in their Trust and Estates department. In 1992, she moved to Miami where she helped launch a restaurant, managed Kenny Scharf’s art studio and produced special projects for Ocean Drive magazine. Two years later Anderson was back in NYC with her fist baby and working part-time for Patrick McMullan. After raising two children, going through a divorce, and making ends meet doing TV commercials and film, she decided to return to her passion and became the director of Keszler Gallery in NYC and the Hamptons. In 2011, Anderson launched Mayson Gallery on New York’s Lower East Side which she left to her partner after four years. The Financial District/Seaport arose as the the perfect place for a new chapter in art.